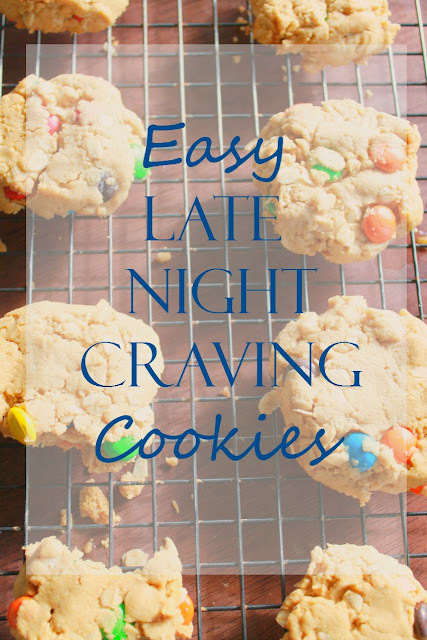 Have you ever been craving something sweet late at night. You really want something to munch on while you're watching Netflix or engrossed in your latest read? (Story of my life right there). You hit up Pinterest and look over your dessert board for some inspiration. You find The BEST Cookie Recipe Ever. You think that sounds perfect and start reading through the recipe to make sure you have all the ingredients, "Flour? Check. Sugar? Check. Eggs? Check. Room Temperature Butter? Um...I have cold butter in the fridge." If you're anything like me you've actually Googled about melted butter which only leads you to a different recipe that allows for melted butter but then calls for some time consuming detail like refrigeration for x amount of time. Preheat oven to 350. Combine PB, sugar, egg, and baking powder until creamy/smooth. Fold in oatmeal and candies. Mix until combined. Scoop spoonfuls of dough onto greased cookie sheet and gently press down on each roll of dough to make sure the dough sticks together and is combined. Bake for 8 minutes and allow time to cool. That's it--six ingredients, super easy prep, low baking time, and delicious cookies ready for you to enjoy in minutes--literally. Pretty please give these a shot and if do-let me know. What is your go-to cookie recipe?